I took a break from blogging to enjoy my grandsons at the ski hill this past weekend. What a treat it is to spend time with little ones! I love the way 2-year-old Calvin says “bo-na-na” for banana and “gii” for ski (both of which he loves). Baby Sam entertained me from his jolly jumper. When the kids were in bed we watched “Eddie the Eagle” – a fun ski movie that took us back to watching the ’88 Winter Olympics from our university basement suite. Good family time all around. Today I was craving a new pastime and my kids were kind enough to take me to the mall for my first shopping trip in over 3 weeks. It was a ton of effort just to manoeuvre through the mall on crutches but it felt so great to be out and about. Here is my first creation. It’s a delightful pass time. I highly recommend it for those looking for a way to fill your wine-less evening hours. Hi there! 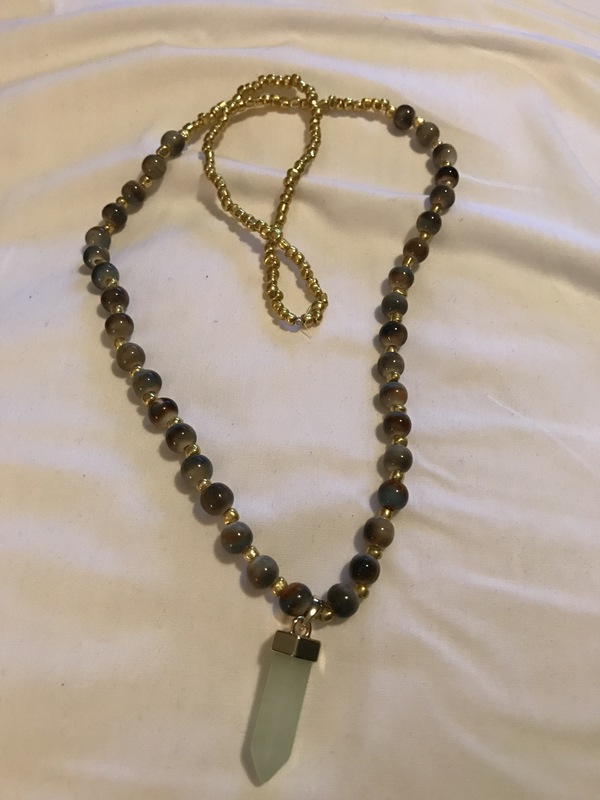 Glad to hear you are enjoying the grandkids and your jewelry making. I need to pick up a hobby, photography used to be a big one I have a pretty sizable collections of photos I’ve taken that I need to do something with maybe printing and framing them to give as gifts. I also want to take up knitting, maybe I’ll swing by the yarn store this weekend. Just finished a full week back on the grind. Work was/is a biiiiig stressor for me, I’m so glad I don’t have booze to make it worse anymore. That plus therapy and starting to excercise again (yoga and beginners pilates) is really helping. Still get tense but now I am working on building a new repertoire of behaviors to help me cope and relax. Day 51 (almost 52–wow!). Have my moments here and there but really surprised how I’ve managed to tell a couple people that I’m not drinking (“no thanks”, “not drinking today” “oh are you not drinking? No I am not.”) And the sky didn’t fall. The more I say no the easier it gets…Amazing how that happens huh? Next week will be a challenge because I drive home for the weekend (my mother was my trigger, enabler, and biggest critic–second to me in this front), but I have my tools to bring with me. Onward to day 52 (tomorrow). Beautiful! It must be quite challenging to work with one hand in a splint! I used to to bead work back in the 70’s! Some of my friends love to do it. Time for me to pick it up again! You can have it. I do now. It was scary at first, but I had to change. I wanted to change. So I stopped. Now I have peace of mind. Drinking doesn’t actually relax anyone. It numbs us to life. Sometimes that feels easier, but in the long run it also dulls the joy and happy times. Try a period of sobriety and see, you may be amazed. Very nice! 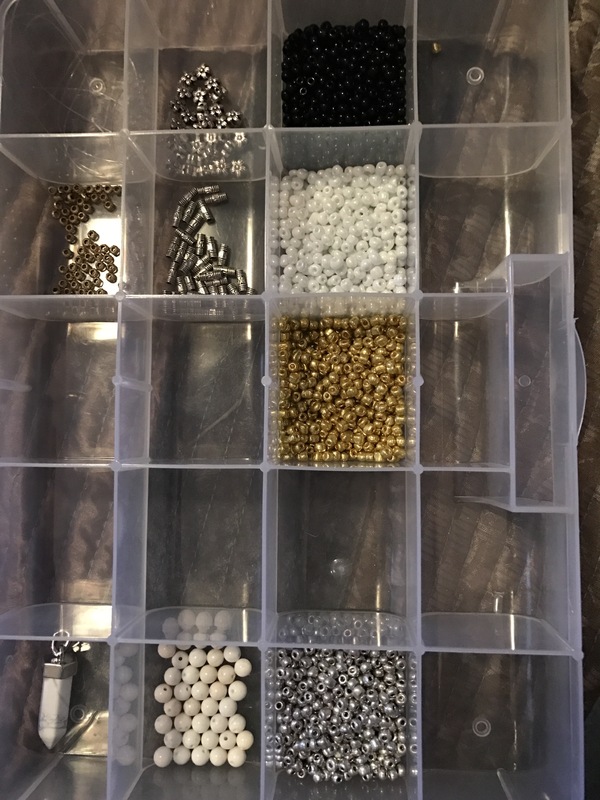 I was obsessed with jewelry making a few years ago and I have lots of supplies and beads that I’d be happy to send to you. Now it’s knitting. Love. Knitting. Soap making. I was all about soap making for at least a solid year. Kind of obsessive. Gave me a creative outlet and busywork for my restless mind as I thought up new scent combinations and molds and packaging. Great fun and need not be too costly.